Dan Hubbs enters his sixth season as head coach for the Trojans in 2017-18. Hubbs holds a career head coaching record of 137-143 in five seasons at the helm for the Trojans. He coached the Trojans to their first NCAA Tournament appearance in 10 seasons. 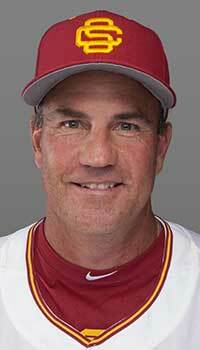 He was elevated to head coach from associate head coach on February 13, 2013, when he was named the sixth head baseball coach at USC since 1930. Hubbs spent the 2012 season as the associate head coach of Troy, and prior to that he spent 12 seasons as the pitching coach at California. After taking over the position on Feb. 13, 2013, just days before the start of the 2013 season, Hubbs' inherited one of the youngest squads in program history. The team finished with a record of 20-36 overall, 10-20 in Pac-12 play, good for ninth in the conference, gaining experience for the upcoming seasons. That squad, a year older in 2014 was on a mission, going 29-24 overall, 16-14 in conference play, tying for fifth overall. That year the team was announced as one of the first four out of the NCAA Tournament. Under his watch those Trojans righted the wrong of 2014, and were a force to be reckoned with in 2015, finishing an impressive 18-12 in Pac-12 play (tied for third) and were 39-21 overall, after advancing to the NCAA Regional Final of the Lake Elsinore regional. Under his watch that season the offense thrived, leading the Pac-12 in runs (377), hits (614), RBIs (347), stolen bases (94) and was second in batting average. Hubbs was a three-year (1991-93) letterman at USC and currently ranks fourth on the Trojans career saves list (22) and eighth on the career strikeouts per inning chart (9.19). He posted a career record of 19-13 with a 3.58 ERA in 81 appearances (64 in relief). In his 12-year (2000-11) tenure at Cal, the 46-year-old Hubbs regularly produced team ERAs among the lowest in the Pac-10. Three times, his pitching staff set a school record for season strikeouts, including 475 in 2011 when the Golden Bears--a program that was slated to be discontinued after 2011 due to budget cuts but was saved through fundraising efforts--advanced to the College World Series for the first time since 1992. His 2011 staff was second in the Pac-10 with a 2.90 team ERA, posted 11 shutouts and at one point went 47 innings without allowing an earned run. Besides being a top recruiter, he helped develop some of the greatest pitchers in Cal history, including current major leaguers Brandon Morrow, who became the school's highest draft pick ever (fifth in 2006), and Tyson Ross, Freshman All-Americans Kevin Miller (2008), Justin Jones (2010) and Kyle Porter (2011) and 2011 All-Pac-10 first teamer Erik Johnson. He produced Pac-10 save leaders in 2001 (Matt Brown) and 2004 (Jesse Ingram) and the school's career strikeout leader (Trevor Hutchinson). He had four pitchers drafted in 2011 and three in 2008. Between his time at Cal and USC, 28 of his pitchers sign professional baseball contracts. Before going to Cal, Hubbs was the pitching coach of the Yakima Bears (a short-season single A minor league Los Angeles Dodgers affiliate in Yakima, Wash.) and assisted Pepperdine during the 1999 season. After seeing action in just four games as a 1990 freshman, he had a 7-2 record with a 3.60 ERA as a relief pitcher in 1991 as the Trojans won the Pac-10 title. He went 7-6 in 1992 with a 3.97 ERA as a starter. He returned to the bullpen in 1993, setting the since-broken USC season saves record (a national-best 18) while going 5-5 with a 2.96 ERA and a team-high 90 strikeouts as he earned All-American first team and All-Pac-10 first team honors. The Trojans advanced to the NCAA Regionals in 1990, 1991 and 1993. He had a seven-year (1993-99) minor league career with the Dodgers and Philadelphia Phillies. He finished second in the Dodgers' organization with 126 strikeouts in 1994. In 1996, he went a combined 16-1 between AAA Albuquerque (7-1) and La Romana (9-0) of the Dominican winter league, and was named to Baseball America's Winter League All-Star Team. He led the Pacific Coast League in appearances in 1997, taking the mound 62 times in a 144-game season. He finished his career with a 27-16 record with nine saves and a 3.75 ERA. In 427 innings, he struck out 436 while walking only 172. Hubbs earned a bachelor's degree in finance from USC in 1993.